SINGAPORE – A system of parcel lockers will dot the island and an Airbnb equivalent for cargo space will be rolled out as part of a plan to modernise the logistics sector. The Infocomm Media Development Authority (IMDA) outlined the two initiatives – aimed at driving parcel delivery efficiencies and lowering the cost of freight charges for small shippers – on Wednesday (Nov 1). The cargo space trading system is part of what it says will be the first of many sector transformation blueprints known as Industry Digital Plans (IDP). It intends to announce more IDPs for sectors that are lagging behind in going digital. The goal is to help small and medium-sized enterprises (SMEs) here confront business challenges brought by digital disruption, as spelt out under the SME Go Digital Programme. The kitty is $80 million over four years from this April under this scheme, first announced in February. 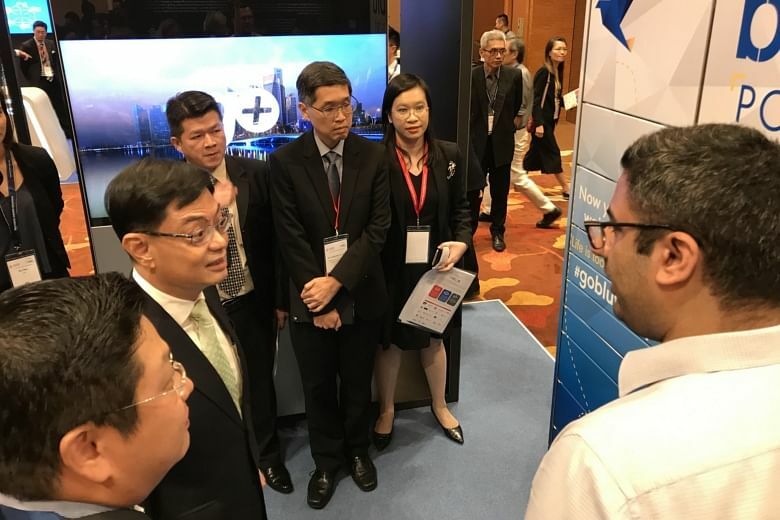 Announcing the plan for the logistics, Finance Minister and chairman of the Future Economy Council Heng Swee Keat said these plans are tailored for the industry to grow. “When we talk about the future economy, it is important to remember that amid the changes, we continue to see growth opportunities,” he said. He was speaking at the inaugural Future Economy Conference and Exhibition 2017, organised by the Singapore Business Federation, at Sands Expo and Convention Centre in Marina Bay Sands. Singapore’s go-digital push has given IMDA an outsized role in helping to plan the transformation of major sectors here. The next IDP will be rolled out for the struggling retail sector, as well as for food services, wholesale trade, environmental services and security. Through these sector-specific IDPs, IMDA will identify projects with the potential to help SMEs grow their business, which will, in turn, lift the sector. The authority will work with the private sector to co-create technology solutions. For the logistics sector, one such solution is the parcel locker system to reduce house-to-house delivery inefficiencies, especially given the increase in online shopping. Citing data from logistics providers, IMDA said that more than one in 10 deliveries could not be fulfilled due mostly to recipients not being at home. It is thus looking to roll out a network of lockers – akin to extra large mail boxes – to facilitate deliveries without recipients needing to wait at home. IMDA will request proposals from companies by the end of this year for 75 lockers to be installed in public housing estates and train stations in Punggol and Bukit Panjang. The pilot is slated to go live in the second half of next year and will last six to 12 months. The plan is to have some 760 lockers around Singapore eventually. Currently, similar systems already exist, for example, SingPost’s Popstation and Ninja Van’s Ninja Boxes. But the lockers accept deliveries that only the respective service providers process. The locker system proposed will not be tied to any single operator, and can be used by all couriers, potentially benefiting more than 7,600 logistics service providers here. The second project announced is the Airbnb equivalent for cargo space, where large shippers can sell unused cargo space at a discount to smaller shippers. IMDA has signed a memorandum of intent with locally based e-freight platform provider vCargo Cloud to create this platform. Logistics firms France-based Bollore Logistics (Singapore) and Taiwan-based Dimerco Express Singapore and insurance broker LCH Lockton are also participating in the project.